Rio de Janeiro, 04/09/2019 – The Working Group on Intellectual Property (GTPI), coordinated by the Brazilian AIDS Interdisciplinary Association presented a post grant opposition against the granting of the patent for the drug daclatasvir at INPI. The GTPI comprised by civil society organizations, advocates for better access to medicines. Daklinza®, the brand name of daclastavir, is a drug marketed by Bristol-Myers Squibb (BMS) an American company, indicated for adult patients infected with Hepatitis C and atients co-infected with the AIDS virus. The grant of the patent generates a monopoly that prevents the entry of cheaper generic versions in the market. In October 2018, INPI granted patent PI0716483, referring to daclatasvir. In GTPI’s opinion, this concession is undeserved. The main argument is that the patent lacks sufficiency disclosure, ie, it does not have the level of detail necessary for the technology described therein to be reproduced by a person skilled in the art. This is fundamental to justify the granting of the patent. “It is not possible to reproduce the technology present in the patent of daclatasvir with the information that is in the document of the concession issued by INPI. The patent is too broad and too vague. The object of the patent is not sufficiently described and, in practice, we do not know exactly what is being withdrawn from the public domain”, says GTPI pharmacist and consultant Carolinne Scopel. The importance of the existence of generic versions of daclatastavir lies in the potential reduction of the price of existing treatments today. The price paid by Brazil on the last purchase was $ 1,730 for a full course of treatment of daclatasvir. In Egypt, where there are generic versions, the same treatment costs $ 22.50. Even in countries where there are no generic BMS charges much lower prices, as in Myanmar, where the full treatment costs $ 354. In Brazil, the company even offered a significant discount in July 2018, lowering the price of the treatment to US $ 630, but after the patent was granted, it went back up and charged US $ 1,730. Daclatasvir is used in combination with the drug sofosbuvir. According to the World Health Organization (WHO), this option is commonly used in middle- and low-income countries. In 2018, based on several available evidence, it is now considered a pangenotypic regimen, that is, it can be used for all cases of the disease. Between 2015 and 2017, this was the treatment acquired by SUS. In 2018, 15,000 sofosbuvir / daclatasvir treatments were purchased in an emergency. In 2019, however, the cheapest option was the combination sofosbuvir / velpatasvir, also pangenotypic. The discontinuation of the purchase of sofosbuvir / daclatasvir is directly associated to the price increase practiced by BMS. If BMS maintained the July 2018 offer, the combination of sofosbuvir / daclatasvir would have been purchased at a lower price than the combination sofosbuvir / velpatasvir, since for sofosbuvir a generic national company entered the market and participated in the public tender offering quite reasonable prices lower than brand-name sofosbuvir. About 15,000 patients are currently receiving sofosbuvir / daclatasvir-based treatment and face difficulties with distribution. 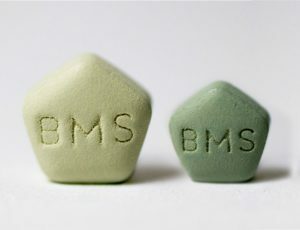 The company BMS is delivering the product in four shipments that continue until May. Some of these shipments contain products with expiration dates close to expiration. “The BMS gives clear signs that it is committing abuse, backed by its newly acquired patent. In 2018, it practiced an absurd increase, which put in jeopardy. We are filling this post grant opposition to fight back these abuses and prevent them from happening again”, explains the GTPI coordinator, Pedro Villardi. Post grant oppositions can be filled within six months after the grant of the patent.